On May 31st, 2016, Michelle Siegle’s life changed forever when she suffered a life threatening intracerebral brain hemorrhage. Despite the doctors’ diagnoses, she woke up after being comatose for 15 days. Michelle spent a month in the ICU of Thomas Jefferson University Hospital in Philadelphia, six months at a skilled nursing facility in Marlton, NJ and is currently receiving therapy at Magee Rehabilitation Hospital in Philadelphia to relearn how to walk, talk, eat, and resume daily activities again. Michelle was always on the go between working, cooking, cleaning, and spending time with her husband of 25 years, Ed, and daughters Megan and Melanie. She loves to feed people and is known by many for her radiant smile. Ed spends every evening after work with Michelle while balancing a full-time job and making the necessary renovations to make the house handicap accessible. In just a few short weeks, Michelle will be coming home! However, the out of pocket costs not covered by insurance for bringing Michelle home has been and will be expensive. Ed has already paid just over $10,000 for the home renovations. Ed will need to pay approximately $2400 per month for a home health aide as Michelle will need an aide to be with her for safety reasons for the foreseeable future as Ed works during the day and her daughters are away at college. A ramp has been installed and is being paid for monthly at a cost of $625 per month. This is a challenge the Siegle’s cannot face alone. 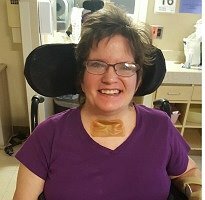 To help with the financial burden of Michelle‘s uninsured expenses, a fundraising campaign in her honor has been established with Help Hope Live, a trusted nonprofit organization that has been providing community-based fundraising guidance to patients and their families for more than 30 years. All donations are tax deductible to the full extent allowed by law, are held by Help Hope Live in the Mid-Atlantic Catastrophic Injury Fund, and are administered by Help Hope Live for injury-related expenses only. Please consider a contribution. Thank for your support and prayers for Michelle. Be sure to check Michelle’s campaign page at www.helphopelive.org because we will be posting updates regularly. Michelle has fully regained the ability to eat and drink. With the funds we have received we payed off the ramp We are now working on getting Michelle to walk, To that end we will be restarting outpatient therapy in March. Michelle continues to need a caregiver at home during the day while Ed works. We are thankful for the support we have received up to this point and would make use of any further contributions to go toward her caregiver expense which is $2,240.00 per month..
Ed, I donated to your cause last week. I can only hope it helps. God bless you and your family. Linda and I are praying for Michelle's recovery and to come home soon. Take care. Sending in a check today. It's not much but hope it helps. Michelle, you are a true example of what it is to be a fighter!!! Ed, you are God's example of what a husband should be. God bless you both and hope to see you soon.